I confess it might be my favourite. I love stretching the pastry! And the flaky layers are lovely to eat. Here’s a bigger traditional pastry one with tart dried cranberries instead of raisins. And here’s one with a tasty slightly sweet lower-gluten pastry. 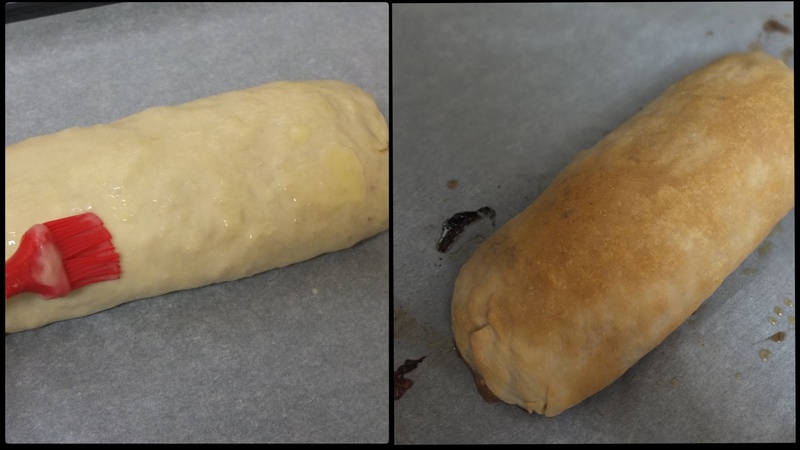 I used Schubeck’s recipe as a starting point then adapted, making the first strudel full size then the following ones half-size, which is easier to roll. There’s a debate about including egg in the pastry. Many recipes don’t so I eliminated it and avoided using just half an egg yolk. Coincidentally the pastry became vegan! Cool. Apples – use tasty apples that aren’t too watery or mushy, for obvious reasons. I use reinettes apples (as seen in the photos) – they hold well, aren’t too juicy, with character and flavour. I chop cubes as evenly as possible with 5mm sides – seems better for flavour distribution and allows for easier rolling than slices. Dried fruit and nuts – I finally preferred sultanas to the tart cranberries. 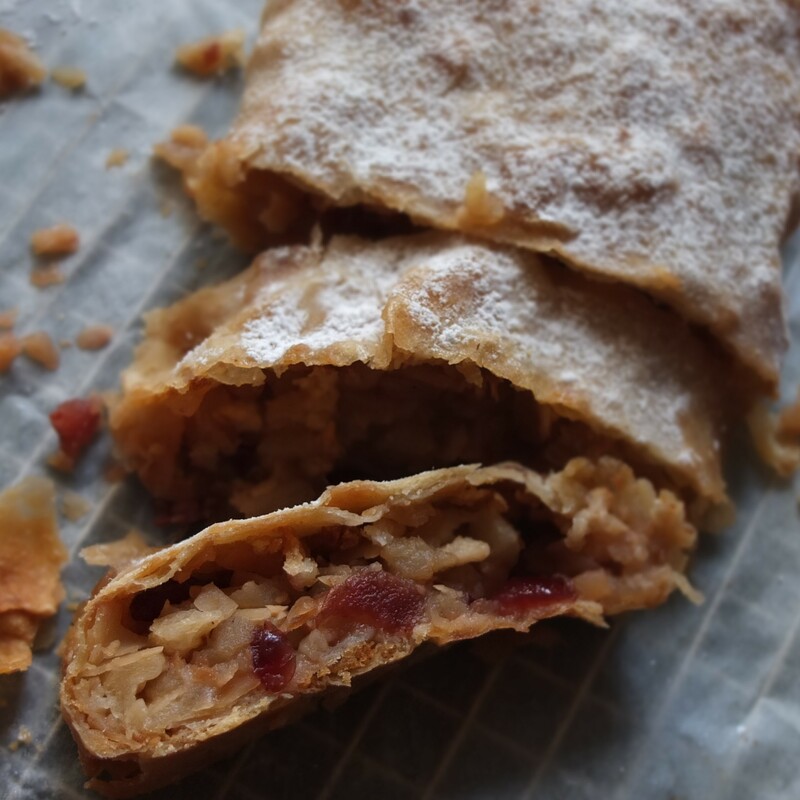 You can omit the dried fruit though strudel purists say raisins are essential! Schubeck adds toasted flaked almonds but they were a bit big. I prefer finely chopped pecans which are softer and smaller, allowing the apples to maintain their star status. You can also have no nuts. Bread or cake: Alfons Schubeck uses ladyfingers (sponge fingers), others use cake crumbs and many recipes suggest toasted bread crumbs but I wasn’t that impressed with the results from toasted crumbs in prototype 1 so no toasting from now on. I suggest you use whatever’s handy. I used the glutenfree sponge and lower-gluten brioche in my freezer. Lemon juice. A little lemon juice enhances the flavour of the apples. Butter. The amount varies but I’ve increased the quantity in the original recipe for a pastry that’s nicely crisp and buttery but not too greasy. It’s down to taste. Spices. When I increased the cinnamon and added cardamom the flavours really came together. Adjust to taste. 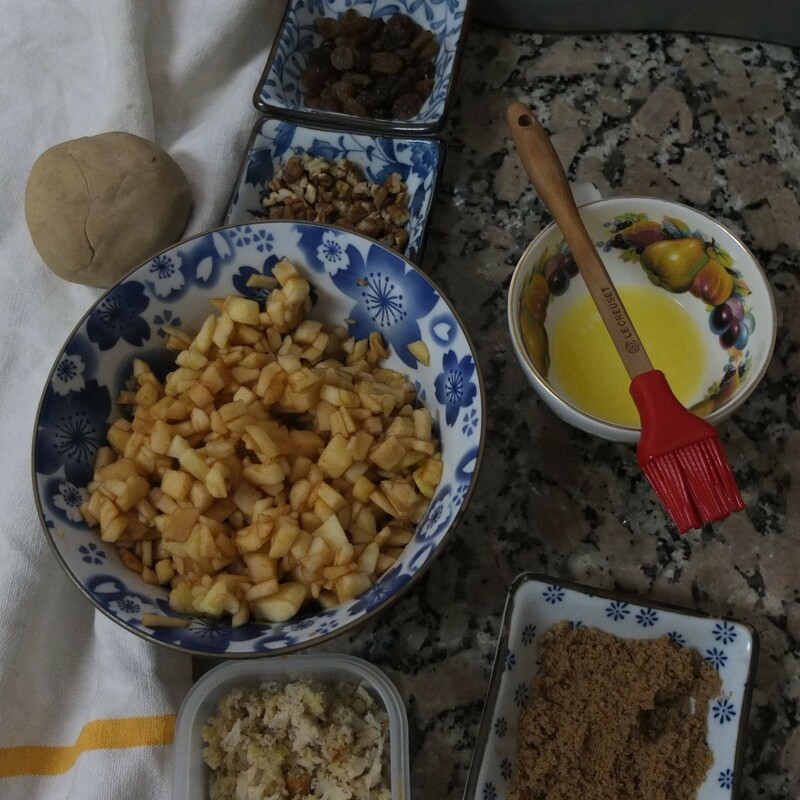 Soak sultanas in rum; make pastry (5 mins to make then rest 1 hour); while pastry’s resting prepare filling ingredients (15-25 minutes depending on how fast you chop apples) and melt butter so it cools before assembling; assemble/roll (10 minutes); bake (35-45 minutes). From start to finish it’s about 1 hour 40 minutes with just 25-35 minutes’ work. 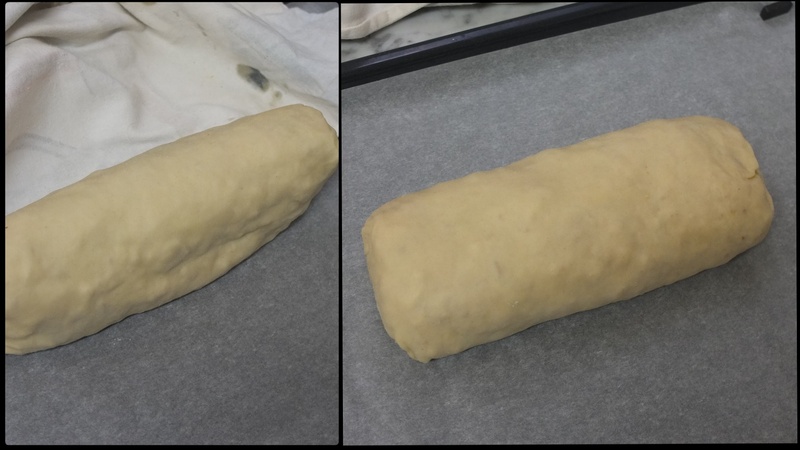 Pastry – the quantities below make the larger strudel that fits diagonally or curved on a large 40cm x 30cm baking tray. 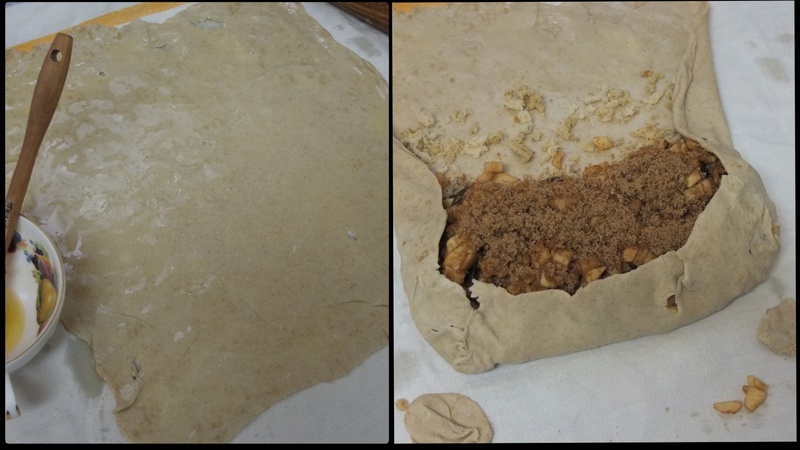 To make a smaller 3-5 person strudel split the pastry in two and freeze half for another day. Whisk your flour and salt in a large bowl to combine. Whisk the water and 24g of oil together in a small bowl. Make a well in the flour and pour in the water and oil. (b) stir in the bowl until the dough starts coming together, empty contents out onto the table and knead by hand about 5 or 10 minutes until the dough is smooth and comes off the table easily. NOTE: I’ve used methods (a) and (b) and they both work fine. But be careful not to overknead. The dough should be a little elastic but still soft – if it becomes too stiff it’s difficult to stretch. Cut into two equal halves to make two balls (for smaller strudels). Coat lightly in the extra oil with your hands. Wrap in plastic film. Let the dough rest 1 hour (don’t freeze the other half yet – keep it around in case for emergency patching. Lol). Meanwhile prepare the filling. Follow the instructions above for the traditional pastry but whisk the flours, salt and xantham gum together. And in a separate small bowl whisk the water, vinegar and oil together. 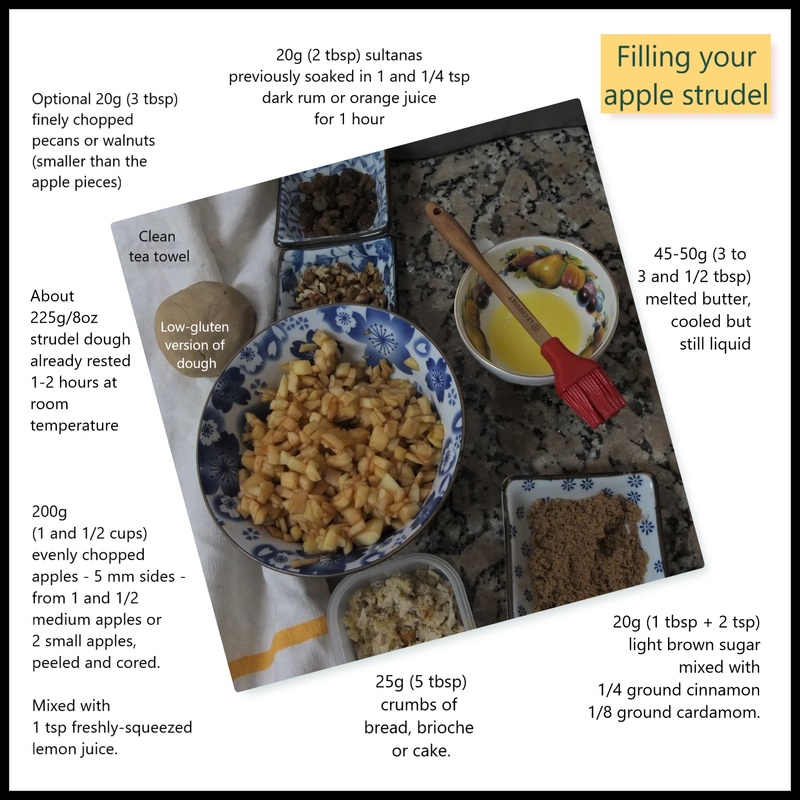 For a gluten-free version check out the Gluten-free Cottage’s strudel recipe which inspired me to use teff flour and apple vinegar. Soak 20g/2 tbsp sultanas in 1 and 1/4 tsp dark rum or orange juice for 30 mins to 1 hour (or more). Preheat your oven to 180°C/350°F (fan-assisted) or 200°C/400°F (static, non-convection oven). I don’t pre-mix all the ingredients because the sugar starts making the apples watery. And sprinkling separately helps distribute the sultanas and nuts more evenly. 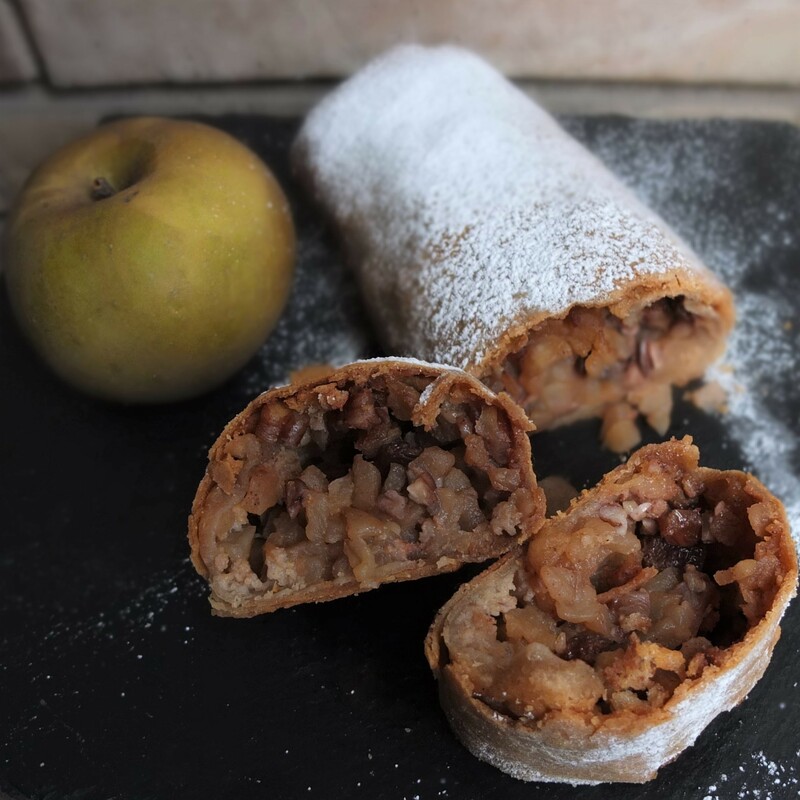 If you choose to pre-mix the ingredients then do it just before rolling the strudel but keep the bread or cake crumbs separate – apparently they form a barrier between the apples and pastry, soaking up liquid. Before starting you could watch a funny little youtube video: Strudel – watch a pro stretch dough. It shows the technique for hand stretching dough with some great tips, though you need practice to get as good as that little lady. Amazing. Anyway we’ll be fine starting with this smaller rectangle. By strudel prototype number 5 it was getting easier and neater but even number 1 held together. Sadly the first lower-gluten one semi-collapsed on the way to the baking tray and was patched up with extra traditional pastry! Poor thing… but could still eat it! Be careful but it’s all good and edible. 🙂 With the now improved lower-gluten pastry you can safely follow the steps below but your rectangle will be a bit smaller and thicker (have less rolls to avoid undercooked pastry layers). Immediately brush all over with melted butter. 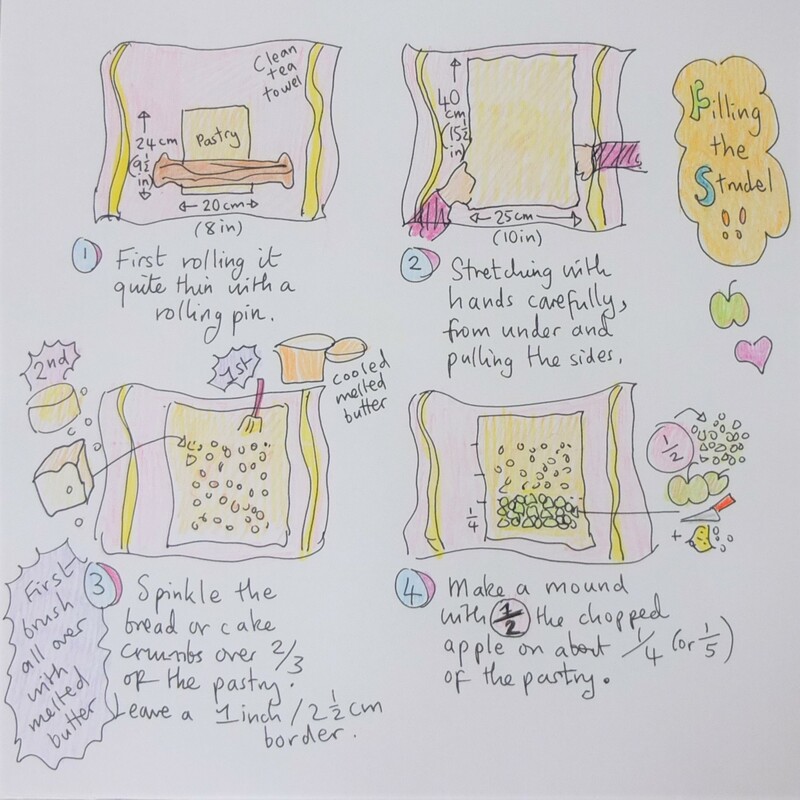 Sprinkle the bread or cake crumbs over 2/3 of the pastry (as shown in the illustration), then make a mound with half of your chopped apples. This is a delicate operation but it does get easier with practice! Roll it so the seam is under the strudel. Brush with more melted butter and bake 15 minutes. Then lower the oven temperature to 160°C/320°F (fan-assisted/convection) or 180°C/350°F (static, non-convection oven) and bake a further 15 minutes. If it’s still a bit pale (you can brush again with more butter here if you like) bake a further 5 to 10 minutes until the strudel’s light golden brown. 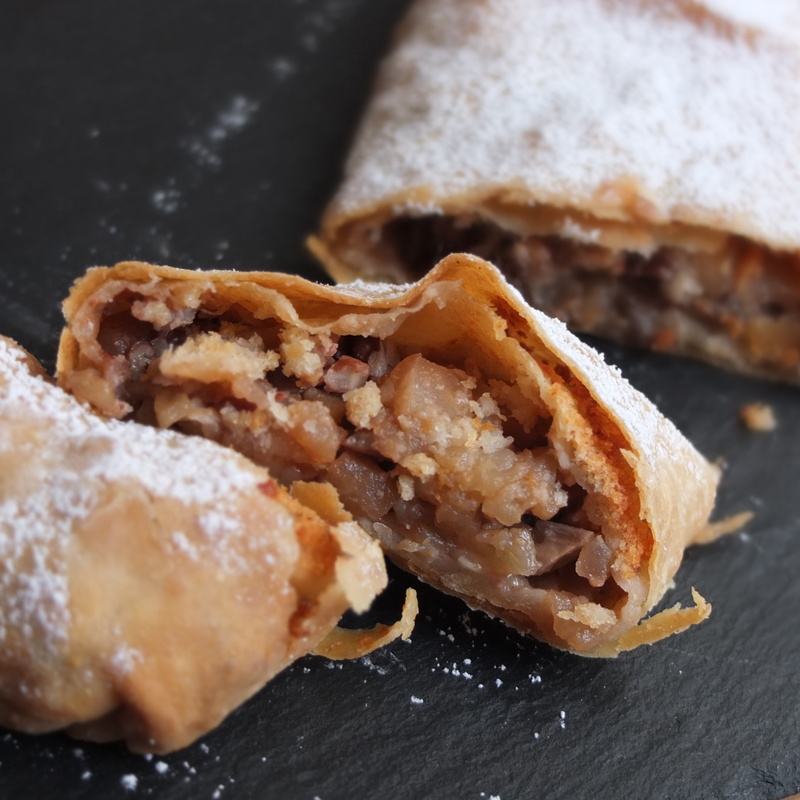 Allow your strudel to cool down to warm before sprinkling with icing/powdered sugar. You can serve with cream or ice-cream. Best eaten on the day at room temperature when the pastry’s crisp and flaky. After that store in airtight tupperware in the fridge. It’s also yummy on day 2 or 3 with softer pastry and more developed flavours. Thank you Mr Schuhbeck for the painless yummy experience! Alfons Schuhbeck is one of Germany’s top chefs. He’s also a celebrity, author and businessman with his own restaurant! He was a telecommunications technician when he met Sebastian Schuhbeck, a restaurateur. No the name’s not a coincidence! After Sebastian set him on his career in hospitality and became his mentor he adopted him! Wow! If you’re interested, Alfons Schuhbeck’s restaurant Südtiroler Stuben (2 michelin stars! ), wine bistro, catering service, cookery school, spice shop and ice-cream parlour are based in Munich. 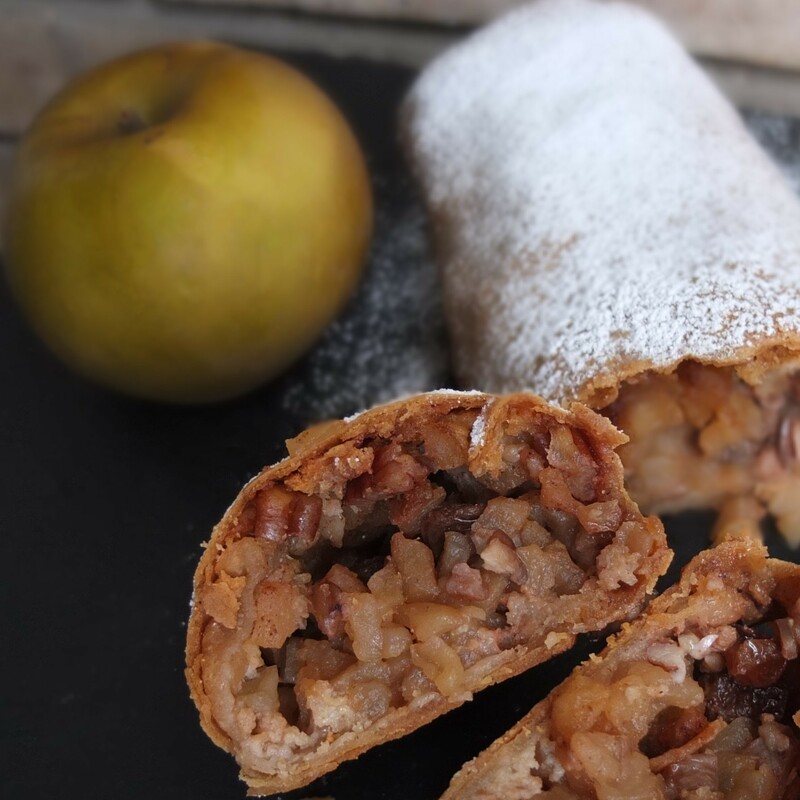 Surprisingly the strudel didn’t originate in Germany but in Austria where it’s considered a national dish! 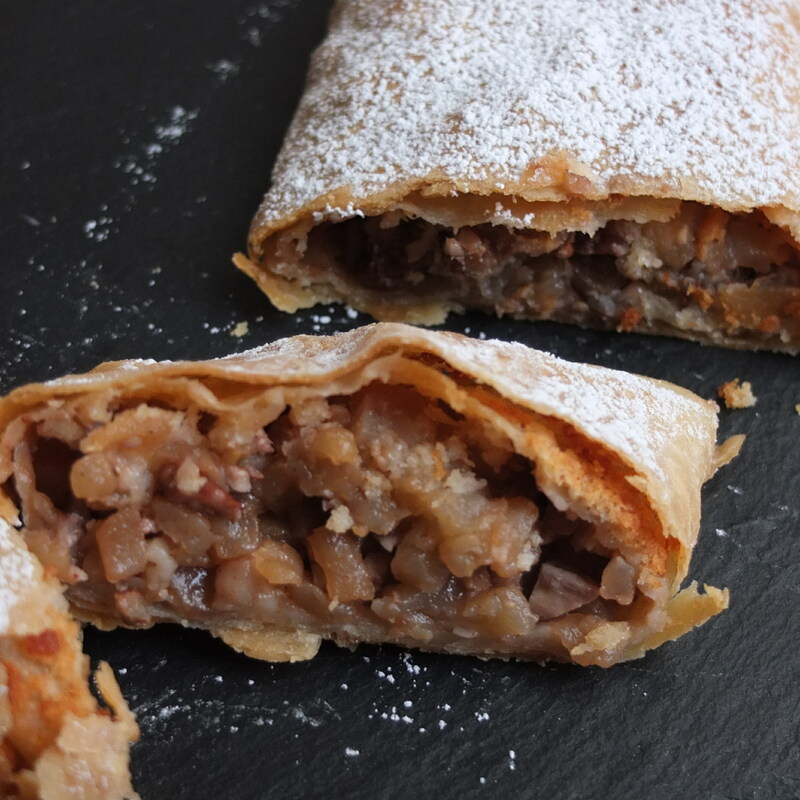 And according to the Wikipedia article on Apple Strudels the oldest known recipe dates from 1697. 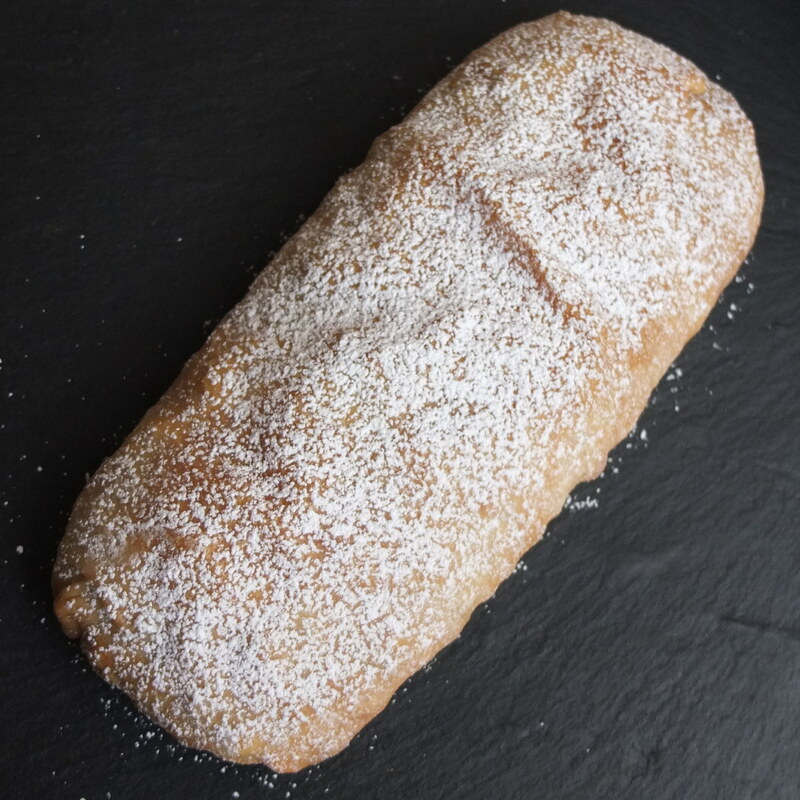 Strudel is a German word meaning ‘whirlpool’ and you can imagine the pastry wrapping itself like an edible whirlpool around and around a sweet or savoury filling. So thanks again Aisha and Abril for organising the Cooking the Chef challenges. It’s interesting discovering chefs from different countries and checking out their recipes! You can see the Schuhbeck challenge recipes here (in Spanish). And do please have a slice of homemade apple strudel. Maybe a lower-gluten version? Or perhaps the same delicious filling wrapped in traditional pastry? 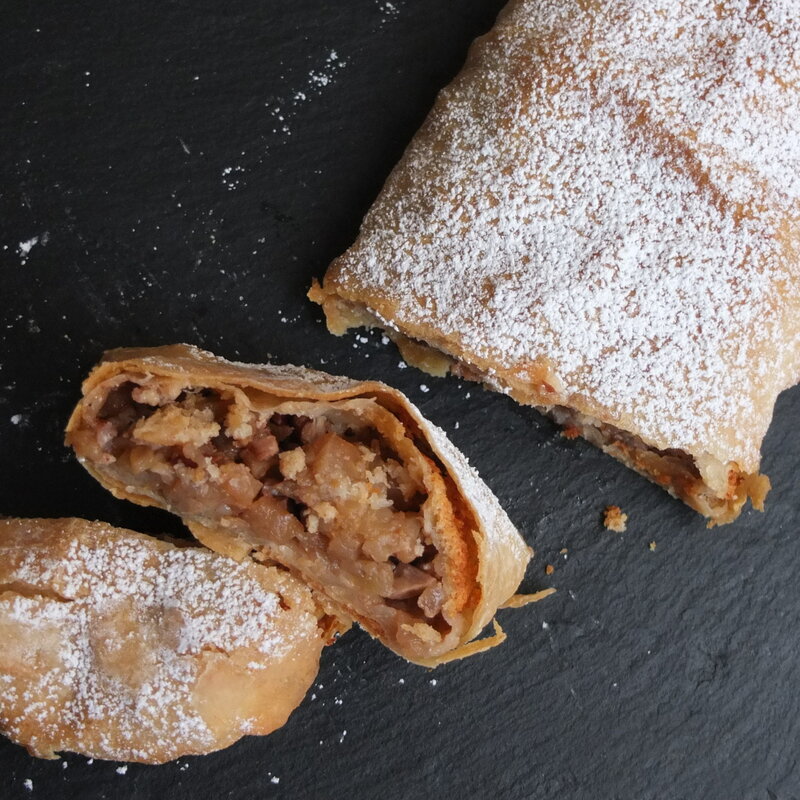 Not the most beautiful dessert ever but apple strudels are truly scrumptious! Tempted?